In an attempt to win back his ex-girlfriend, 27 year old Jeff Bauman (Jake Gyllenhaal), waits for her at the finish line of 2013’s Boston Marathon. At 2:49pm, two homemade bombs explode, killing three people and injuring hundreds more. After regaining consciousness in the hospital, Jeff is told that he has lost both of his legs in the attack. Despite this devastating news, he is still able to help law enforcement officers identify one of the bombers. However, his own battle has just begun. Two words moved me to tears at the end of Peter Berg’s 2016 film, Patriots Day - Boston Strong. Five years on, the city’s refusal to be terrorised in the aftermath of the Boston Marathon bombing is incredibly powerful and inspiring. In David Gordon Green’s Stronger, we see another side of these two words. As we watch Jeff Bauman’s story unfold, so we see how challenging it was for the survivors to move on with their lives while living up to the ideal of Boston Strong. Jake Gyllenhaal is astonishing as Jeff Bauman. He conveys both the emotional and physical struggle inherent in Bauman’s recovery. It now seems criminal that Gyllenhaal did not receive major awards recognition for his incredible performance. Likewise Tatiana Maslany. She plays Erin, Jeff’s on again, off again girlfriend and the reason he was at the finishing line that day. The chemistry between Maslany and Gyllenhaal is palpable. Hers is a powerful and heartbreaking portrayal of personal conflict and selfless love. The basic facts of Bauman’s story provide more than enough material for a gripping bio-pic. However, David Gordon Green seeks to travel deeper - to examine the reality of Bauman’s situation - his courage and his very human flaws. 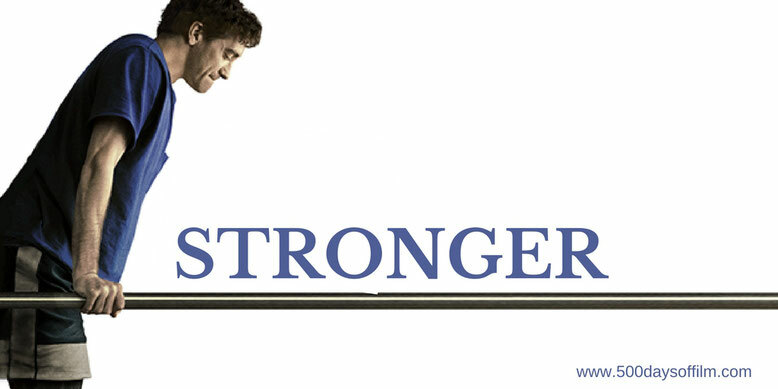 As a result, Stronger is an impressive example of authentic cinematic storytelling. Indeed authenticity was key throughout the film’s production. John Pollono based his script on Bauman’s autobiography but the writer also encouraged Jeff, his family and Erin to open up and reveal ever more personal recollections. Stronger was filmed in Boston and many of the real people from Bauman’s life at that time were cast to play themselves. For example, when Jeff’s parents, Patty (a brilliant performance from Miranda Richardson) and Jeff (Clancy Brown), are told about his shocking injuries, the voice we hear is that of Jeff’s real life surgeon, Dr Jeffrey Kalish. Meanwhile, Gyllenhaal developed an extremely close relationship with Bauman himself - noting his character traits, listening to his stories and watching him move both with and without his prosthetic legs. This enabled the actor to understand what was required from his (superb) physical performance. However, Stronger is impressive in terms of both what we see and what we don’t see. An effective combination of performance, make-up and CG lead to some extremely powerful and moving scenes. Ignoring those responsible for this horrendous act, Stronger turns the focus onto us - asking us to consider how we react to the people caught up in such atrocities and the significant weight of our expectations. In the aftermath of the bombing, Jeff Bauman became something of a celebrity. While he was always moved by how much his experience inspired others, the pressure of being a “hero” was often overwhelming. As a result, while Stronger is an inspiring example of Boston Strong, David Gordon Green’s film is also a restrained, authentic and intimate tale - a courageous yet very human struggle against formidable odds. Jake Gyllenhaal was nominated for Best Actor at the Critics’ Choice Awards. Have you seen Stronger? If you have, what did you think of this film? Let me know in the comments section below or you can find me on Twitter @500DaysOfFilm!